Join us in honoring the many milestones our members celebrate by being part of our chamber. Check back frequently to see our newest ribbon cuttings, networking mingles and other events around town. Thank you Seminole Rec Center for putting on a frightfully Spooktacular event! We had a wonderful time with the community at our table that was decorated as Nightmare Before Christmas. We won Directors Choice Award! What a wonderful evening celebrating our newest members! 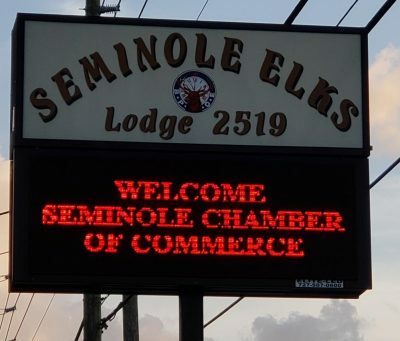 Welcome to the Seminole Chamber! THANK YOU TO OUR FOOD SPONSOR JOTO’S PIZZA! What a wonderful celebration at the Seminole Elks Lodge 2519 on Thursday, October 4th 2018. Thank you to the Elks Lodge for hosting as well as everyone who came out to make this a great networking event! Thank you to Dr. Lurie, St. Petersburg College Seminole Campus and everyone involved in making our Civic Building a reality. Thank you to everyone who participated in our Annual Health Fair! We had over 50 amazing vendors that ranged from healthcare, fitness, finance, nutrition and everything in between.